Restored by Channel 4's Salvage Squad program with the Lancastrian Transport Trust 304 was seen by millions of people when the show was broadcast early in 2003. This photo shows 304 whilst undergoing some follow up filming in Blackpool on the centre track at Tower on 12 September 2003. Blackpool Coronation 304 became a star after its apperance on Channel 4's Salvage Squad program broadcast in the UK on 17 February 2003. 304 was the first Coronation tram of the fleet and arrived in the resort on 5 June 1952 having cost £10,000 and quickly started testing before the tram was officially unveiled to the public on 16 June, 3 days after the Ministry of Transport had inspected and passed the tram for public use. The Coronations were 50 feet long and 8 foot wide (larger than the standard Blackpool tram size) and had space for 56 passengers to sit down. 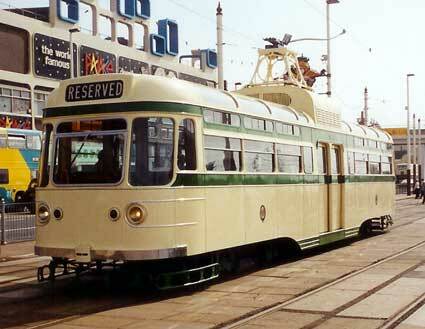 The tram was finished in a mainly white livery with green stripes above and below the windows and beadings on either end of the car. The major initiative of the Coronations was to be the Vambac (Variable Automatic Multinotch Braking and Acceleration Control) control system. This, it was claimed, would give high rates of acceleration and braking and smooth movement, all in one lever. 304 eventually entered service on 3 July 1952 (less than a month after arrival). However despite the initial impressiveness of the trams they soon started to cause problems, mainly with the Vambac system. The accelerator was housed above the platform and often short circutited when dust and sand got into it which lead to a complete failure. There were also instances of the driver going to put the brakes on and nothing happening. Because of these regular failures from 1964 many of the class had the Vambac equipment removed and replaced with conventional controllers, 13 of the class being so treated (although not 304). At this time the Coronations were also repainted into a half green and half cream livery along with an orange trolley tower. In the late 1960s 304 was renumbered 641 as part of the mass renumbering scheme of all the trams in the Blackpool fleet. As one of the trams not to loose its Vambac equipment 641 was withdrawn from service in October 1970 along with the other remaining Vambac fitted cars. As for the other class members the last ones were withdrawn at the end of the 1975 season, with the exception of 660 which was to remain in Blackpool for use at special occassions. 304 was purchased for preservation by the Coronation Tramcar Preservation Trust and left the town on 15 July 1975 for the Clay Cross store of the National Tramway Museum. The tram has since been sold on a couple of times, to the Merseyside Tramway Preservation Society and now the Lancastrian Transport Trust, with homes at many places including Warrington and the St Helens Transport Museum. In early 2002 the chance came for 304 to be part of the Channel 4 program Salvage Squad which sees vintage vehicles restored to working order. The tram was chosen by the shows producers and returned to Blackpool on 9 June 2002, 27 years after it left the resort. Restoration work had been going on intermittingly since the early 1990s but was difficult due to access difficulties at St Helens. The Salvage Squad team (and volunteers from the LTT) made good progress on restoring the tram and it made its first movement under its own power for over 30 years on 10 November 2002. Although not totally complete Suggs and the Salvage Squad team did their final filming work on 6 January 2003 when the tram went for test and filming runs along the Promenade just before 1230. When the program was broadcast it produced a good response and has shown the way forward for further restorations.